Our client came to us with a unique project. Aly is a philanthropist with a vision for how philanthropy should be approached and practiced in order for non-profits to increase positive impact. 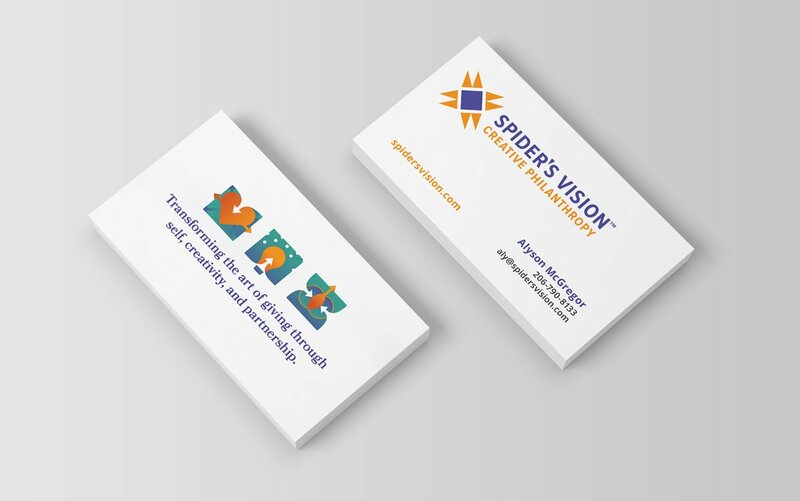 Aly named her project Spider’s Vision, and she needed an identity and a website to share the vision with fellow philanthropists, as well as their non-profit partners. Aly realized her passion for philanthropy while living in an artist colony in central Mexico. The logo mark is an abstract spider, executed with a modern approach to Mexican tribal artwork. The emphasis in the body of the mark represents her idea that philanthropists need to be fully engaged with their inner world. 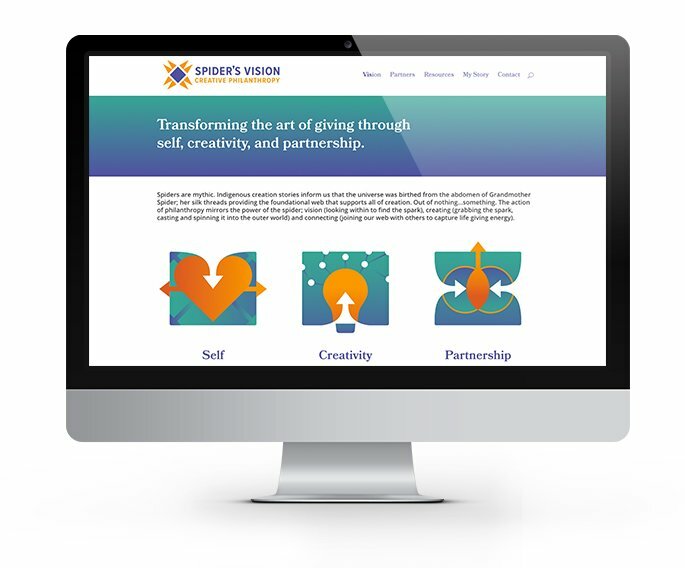 The outward legs represent the outward expression of the spark that originally calls philanthropists into action. 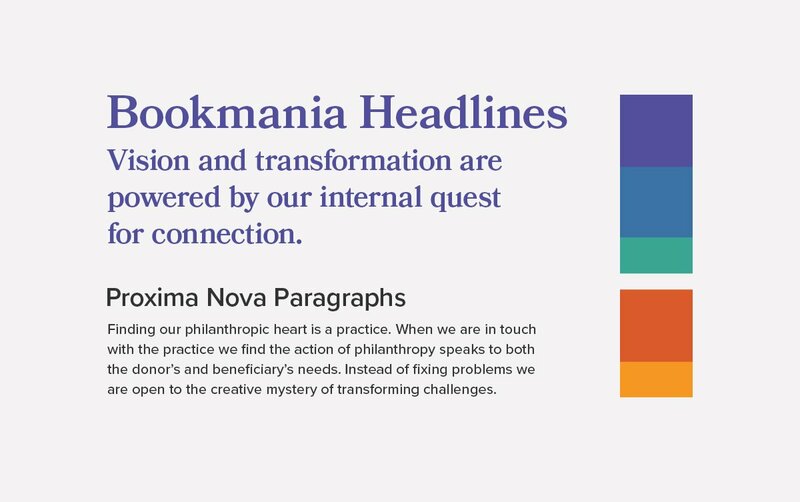 Bookmania is a tribute to a traditional font redesigned for modern use, which makes it appropriate for a brand with educational objectives. It has the mature elegance of a serif font with rounded edges that make it feel friendly and approachable, but with thick enough strokes for legibility on screens. The purple, blue, and teal colors communicate trust, reliability, and maturity. While the cool colors stand for the intelligence behind Spider’s Vision, the orange and yellow accents deliver the energy and optimism that drive philanthropy. We created unique illustrations that help tell Aly’s story and communicate her vision. 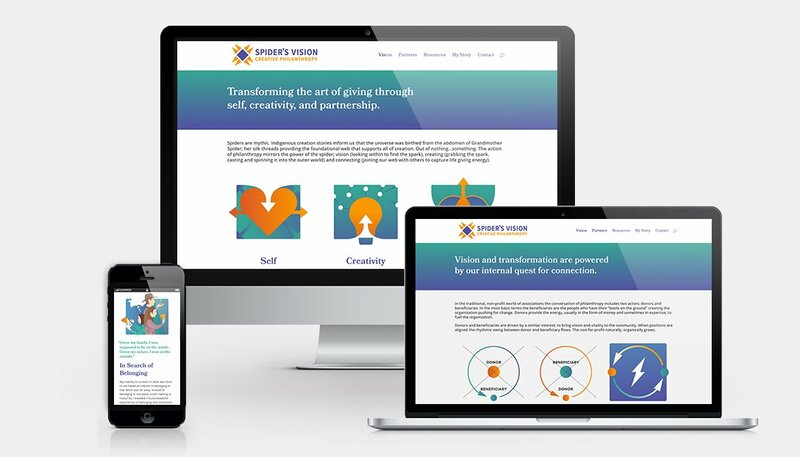 The Spider’s Vision website is educational in nature, providing a platform for the client to tell her story and inspire others with her vision for philanthropy. The website will soon be expanded to include a blog that furthers her teachings and brings others into the conversation. I was amazed at the beauty, flow, and logic of my site! Jonny listened and captured the movement of my story in three major graphics. He used the three graphics to build its foundation and create its rhythm and flow. I was responsible for copy. The words and expression came quickly as I was able to play off the structure Jonny created. The result, an artistic, on target, expression of my vision! Jonny is an amazing artist and editor who is gifted at capturing and expressing a message….mine and yours. I highly recommend him!